On Friday, March 18th I took the exam for certification in Level 1 NeuroKinetic Therapy and passed w/ flying colors. I now can call myself a NeuroKinetic Therapist. Is there a problem with the spinal innervation?, asks the chiropractor in me. Is there a problem with the alignment of the joints that the muscles cross? Is there a problem with the vascular or lymphatic drainage of that muscle? Now I will be adding the question, Is there a dysfunction in the coordination of muscles working in patterns. 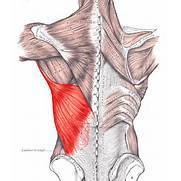 Is the above mentioned latissimus dorsi inhibited by the muscles that attach to the shoulder like the upper or middle trapezius or the levator scapulae or is it compensating (facilitating) for weak or inhibited muscles like the gluteus maximus or the quadratus lumborum say involved in low back pain, for example. NeuroKinetic Therapy works with that concept that movement is performed in systems or patterns. The human brain has an affinity toward habits. For example when we sit down , we use a variety of muscles to both lower ourselves, to keep the upper body straight and to control our balance. An injury to one of the muscles involved in sitting down can cause a patient to favor a compensating muscle and not use the injured muscle which in time becomes inhibited and the compensating muscle becomes a facilitated muscle which does not allow the inhibited muscle to switch back on. NKT identifies muscle imbalances by using muscle testing to determine what muscles are inhibited and what muscles are compensating (facilitating) for them. I would test the muscles involved in the problematic movement. After an inhibited/weak muscle is found, I would muscle test a synergistic (a helper muscle) or an antagonist muscle (an opposing muscle which is strong/facilitated that may be affecting the inhibited muscle. That facilitated muscle would be therapy localized (the muscle is either touched or put in motion) and the inhibited muscle retested. If the TL strengthens the inhibited muscle, then I know that the TLed muscle is affecting the inhibited muscle. Stretches are given to the previously facilitated muscles and exercises given to the previously inhibited muscles.